Spot propylene markets in northeast Asia are expected to be largely quiet post-Lunar New Year holidays in major regional markets. Resumption of trades in the Chinese market after a week-long hiatus should result in a few spot import deals but the volume is not expected to be high. Market players are likely to be in a wait-and-see mood as they gauge movements in the Chinese domestic markets and demand in downstream sectors. With sentiment in downstream markets likely to be similarly cautious, there could be some delays in pick-up of demand. 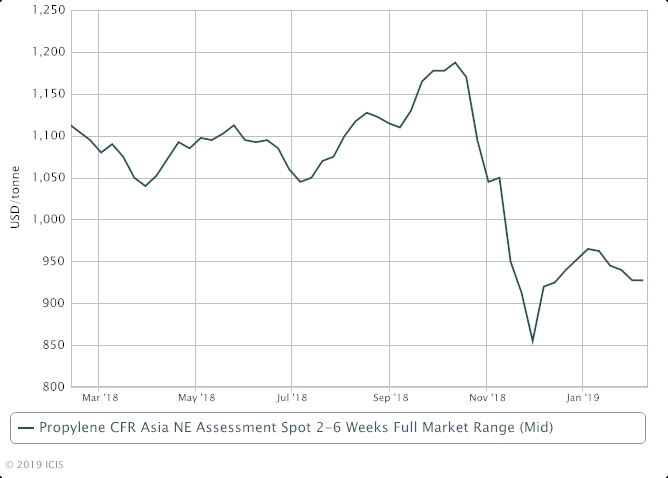 In the downstream oxo-alcohols market, spot demand for n-butanol (NBA) in northeast Asia could stay subdued in the near term. On the supply front for propylene, spot talks will move completely into March arrivals and sellers may not have too much pressure given that they have time on their side to offload the cargoes. As February progresses, demand would start to recover in China while at the same time, supply from South Korea will be slightly constrained by a planned turnaround at one of its facilities. South Korea’s Hyosung is due to shut its propane dehydrogenation (PDH) unit for about a month from 15 February. The plant in Ulsan has a 300,000 tonne/year propylene capacity. Even as the company's other PDH unit continues to run during the same period, export volumes from Ulsan could be affected.